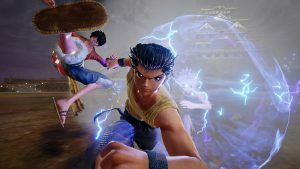 Bandai Namco has been on a roll with adding characters to the ever-growing playable lineup of JUMP FORCE, the upcoming battle action game that’s now due out on PS4, Xbox One, and PC in February of 2019. After recently revealing the likes of Yugi Muto from Yu-Gi-Oh! and Killua and Kurapika from Hunter x Hunter, the new Tokyo Game Show 2018 trailer is here to showcase some contenders from the world of Yu Yu Hakusho. The characters in question are none other than Yusuke Urameshi and Toguro. You can see them below, followed by a look at four original characters designed by Dragon Ball creator Akira Toriyama.